Pugsinspace featured my painting, Queen Bee, in her treasury today! Week 2 Julie Fillo 52 week project "The Hopeless Pirate"
Here is my new piece, "The Hopeless Pirate" It's available on etsy in a limited print run of 12 in the 5x7 size for $5. Free shipping. I'm surprised about how much angst I have about my 52 week project. It's only the second week and I am having performance anxiety. I am a person who can be quite prolific with my art, but something about producing a piece worthy of being a print every week is just about sending me over the edge. I also feel pressure to get some work done ahead, because I know there will be weeks when I won't have time or something. I do have something for tomorrow though and I really love it. and Superbomba who posts vintage photos on flickr that are so hilarious, I was laughing myself silly this morning. I've included one for your enjoyment. Last Wednesday I went to pick up my paintings at the place where I had them last month from the art walk. I was horrified to find when I got there that the manager had taken all my work down and stored it in a warehouse area. I have never had that happen at any show. They always want me to be there to take my work down. One of the other girls art was in there too, and the manager just left me alone with it and said I could carry it out another door, not through the place of business. I was not happy. I carried my work out the door and across the street, stopping by a tree to re-arrange it when it seemed precarious. All the way home, I kept feeling really uneasy about it all, and after an hour and 20 minute drive home, I realized that Simone at Happy Hour and Lucy in A White Garden were not in my car. Now, it takes a lot to get me mad enough to call someone out. But I was really mad. I called the general manager and told her two paintings were missing and tried to control myself from really going off on her. She went and looked in the warehouse area, and then said she would check with the other woman who had already picked up her paintings to see if she got them "by accident". By now, I'm freaking out, pacing, crying, imagining that they had been stolen by the other woman or someone else. Really, really mad. About 45 minutes pass, and she calls me back and says the woman does not have them. Then about 15 minutes later, she called again and said that a patron had found my paintings on the street! Leaning up against a tree! So it was all my fault! And then I felt bad because they were out there on a busy street in Seattle for over 2 hours and nobody stole them. Or maybe nobody stole them because there are still nice people in the world. I got the paintings on Monday. 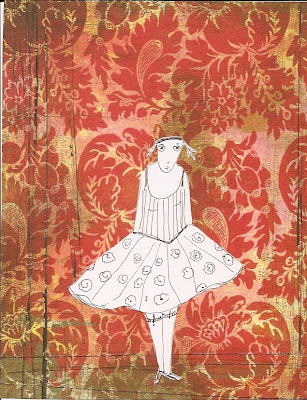 Week 1- 52 Week Project "The Awkward Ballerina"
Here is this weeks print, available on Etsy in a limited edition for $5 each, free shipping... Click on the picture to be taken to Etsy. See explanation below about my 52 week project. I've always wanted to do a 1 year project, and I've decided to start one today, which is a 52nd anniversary for me. The project is that I am going to produce a new piece of art weekly that I will make available on etsy in a limited print format. I am going to sell only 10 of each signed and numbered print in the 5x7 size for $5. Each print will be available starting on Sunday by 12 midnight. Right now, I am going to offer free shipping in the US, but that might change. I will charge $2 shipping for overseas buyers. As each one sells, I will list again until the 10 are gone. In this year of mostly happy chaos in my home life, I'm thinking that having a required project will keep me doing art, which helps me keep sane and makes me a happier person to be around. It also will give my followers a chance to collect my art at an affordable price. I might also sell the original, don't know about that yet. Look on my etsy shop tonight for a new print. ***update*** I've decided to do 12 of each print, once a month I will hold a drawing for the prints for that month and one person who comments on my blog will win all 4 or 5 prints(depending on how many Sundays are in each month). At the end of the year, next April 19th, one commenter will win all 52 prints. So only 10 will be for sale of each edition, but two will be given away. I've just listed most of the new paintings from the last artwalk on etsy! If you are interested in the bigger paintings the girls with birds, 36x40", email me and maybe we can make a deal. ***update*** I forgot one, this is one of my favs of the latest wood batch, "3 Muses"
The past weekend we took our maiden voyage in the new-to-us RV we bought in February. I have done no redecorating, yet. The picture of Zoe illustrates what kind of weekend it was. I wish I could get an action shot of Flight, our greyhound, running on the beach. It is a joy to see. At one point, she ran into the water up to her back, chasing seagulls, and was quite surprised when she found herself up to her neck in water. I never thought she would do that. The first photo is the view out our window, which faced on the Strait of Juan de Fuca. We were camping at Fort Worden. We had coffee at Sweet Laurette's, but mostly we enjoyed the storms and the dogs and the quiet. Tascha told me the other day that she thought one of my paintings was in Cloth Paper Scissors Studios Magazine (page34) along with hers. I ordered the magazine and it is! It's a painting that I sold to Helga Strauss a few years ago, always been one of my favorites. Helga owns Artchix Studio. 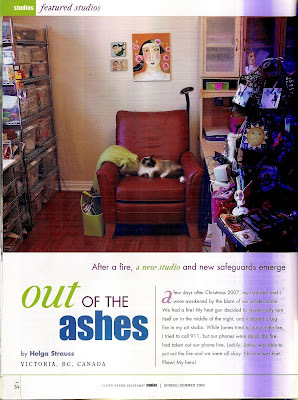 The article is about the studio that she had to rebuild after hers caught fire from a heat gun. I love the idea of my painting hanging by Tascha's in a cool artist's Victoria BC studio. Ain't life sweet? Anyway, it's pretty fun to see your work in print. Your studio looks great too, Helga! Skylar, my 10 year old grandson, was none too thrilled to hear that he was going to be a big brother a few months ago, and time has done nothing to dull his fear that his whole life was going to change, and not for the better. And oh boy, has it ever. He has had over 10 years of being an only child and the only grandchild on both sides. Since Asher was born, he has only in the last couple of days been willing to actually look at him. He has never held him. Today when I picked him up from school, his teacher, Mrs. Keane (a gem of a teacher) made him shake on a deal that he would hold his brother in his arms on a pillow for 3 minutes. There was an insane amount of bargaining and the promise of a treat tomorrow if he did it. Here is evidence that bribery works for Mr. Skylar. The look on his face just kills me. I know, I know, this blog is supposed to be about my art, but isn't he just impossibly cute and sweet and adorable? I am head over heels in love with this child. I know it looks quite dangerous with those knives right above his head in the bath picture, but he can't reach them and I promise we will move them before he can. My kitchen is way too small, but you gotta deal with what you've got, right? Here is a picture of the quilt, finally, we have had 70 degree days the last two, and so I was able to spread it on the grass. It's Glenna Hailey's pattern, her Sailing, Sailing quilt, there is a link to her blog in my list. Glenna's Gabfest. It was really fun to do, the pinwheels took forever though. I've also listed a cake plate that I have had forever that I painted years ago. You can see it in my etsy shop. ***Update** The cake plate is sold. Asher Cody 7lbs 11oz. 19 inches long. He was born on March 31 at 10:35 AM. Megan had a rough go, but they are both doing great and we are all home. He is a beautiful boy. He is only about 5 minutes old in this picture, he has a little red mark on his forehead from one of the monitors, but that is gone now. He stayed up pretty much all night last night, and we were up for more than 30 hours with the labor, I spent the first night at the hospital, so we have not had much sleep, so forgive me if I don't post much in the next few days. Thanks for all the good wishes, we needed them all.